THE pressure to look good has never been more apparent. Cosmetic procedures are common-place, exercise, diet, clothes and hair are all important. So if you start to lose your hair it’s good to know that there’s a solution. 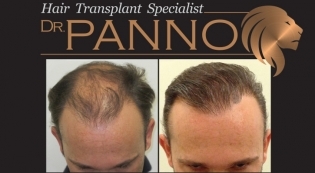 Marbella-based hair transplant specialist Dr Panno has developed, over the last 14 years, a pioneering new hair transplant technique using the ‘trichophytic invisible suture’ to make hair restoration quick, pain-free and minimally invasive, with no visible scarring. So you can return to work and resume your social life immediately. Dr Panno and his team of specialists are known in the medical community for their expertise in micro hair transplant procedures and as inventors of the ‘tricomplete’ technique incorporating both surgical ‘follicular unit extraction’ (FUE), ‘follicular unit transplants (FUT)’ and medical treatments including platelet-rich plasma therapy (PRP) and mesotherapy, promoting growth, volume and shine in the trans-planted and original hair. Hair loss in both men and women can happen for a number of reasons, whether it’s due to genetics, stress, illness, burns, or even unwittingly self-inflicted by wearing hair extensions or over plucking eyebrows. The solution is to get professional advice from a specialist, such as Dr Panno, who offers confidential, no-obligation personal consultants.